We’re proud to introduce Jo from Marble Hill Clockworks! For years, Jo dabbled in creative, moneymaking endeavors – from home knitting and genealogy to vintage fashion. She recently stumbled upon clocks and fell in love. Read more about Jo’s incredible journey! 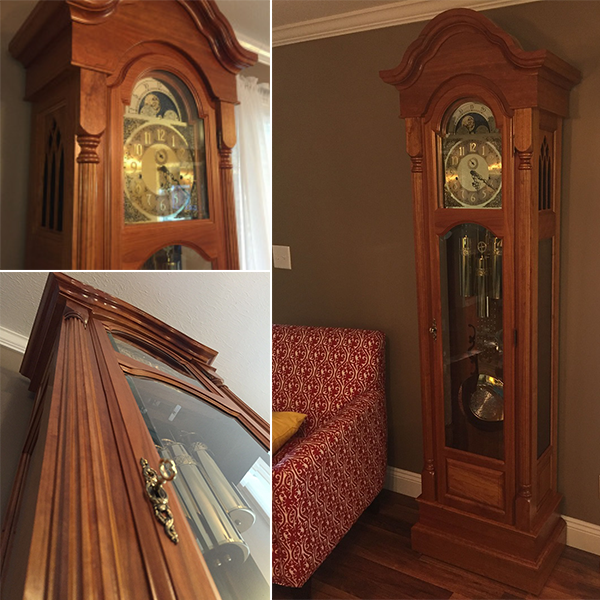 Grandfather Clock Build: The Reveal! 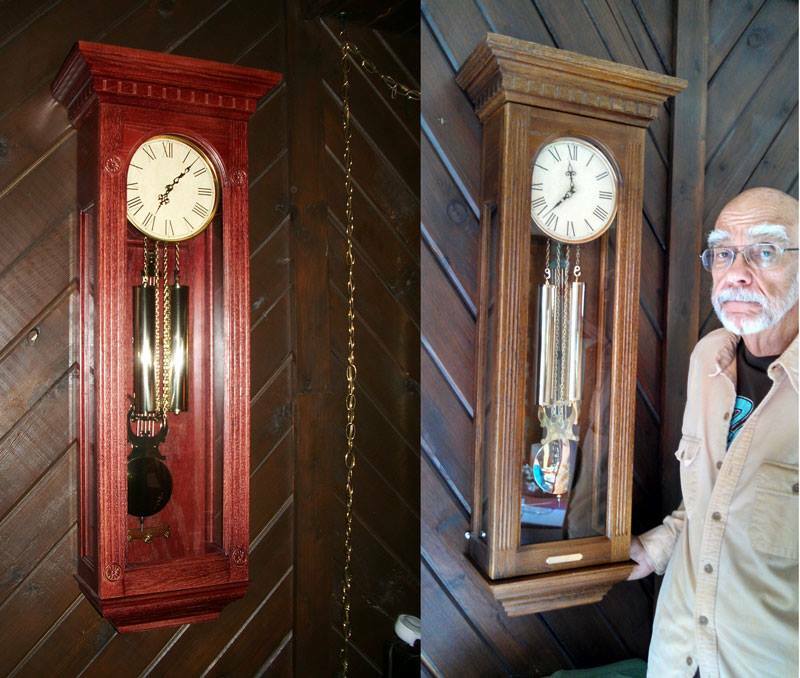 Randy Sharp from Sawdust Inn recently finished his first grandfather clock! It may have took a little longer than Randy had hoped, but he did a fantastic job on one of the most important stages of a clock build…the finishing. Instead of staining his project, Randy wanted the naturally dark cherry color of the wood to shine through. So he began by sanding all the parts with finer courses of sandpaper, finishing with a hand-sanding to 220 grit paper. Then he helped the aging process by exposing the clock assembly to the UV rays of direct sunlight. Thanks to two sunny days, the cherry was noticeably darker! Randy then added a generous coat of Boiled Linseed Oil to help move it towards a rich golden brown. Last but not least, he finished it off with three coats of polyurethane for long-lasting protection. As nature takes it course, the clock will eventually reach a rich, deep crimson red. Here’s a sneak peek of his finished project! See the full reveal here. After some time away from woodworking due to a knee replacement, I recently ventured out to my shop to get started on some projects for upcoming fall and winter craft shows. I spent a couple of hours looking over my machinery and tried to find hand tools and supplies. They were not where they were supposed to be, so I decided that the smartest use of my time would be to get organized! Most of you are probably more diligent than I am about performing shop maintenance. But if you haven’t tidied up your shop lately, I would recommend it! The tips below will help you get organized and smoothly move forward with woodworking projects this fall season. (1) Perform a thorough cleaning of your dust collection system and shop vacuum filters. (2) Check all lighting and make sure overhead lighting fixtures are dust-free. (3) Make sure heaters and furnaces are clean and exhaust fans are working properly. (4) Check all electrical outlets and switches to make sure they are dust-free. 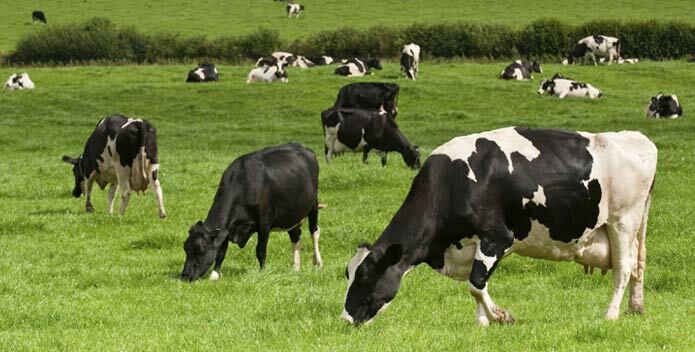 (5) Check all machinery power cords to make sure they are safe. (6) Organize hand tools, boring bits, drill bits, saws, and files. (7) Check all miter and rip fences to make sure all adjustment calibrations are correct. (8) Perform test cuts to make sure power saw blades are capable of making cleaning cuts without burning or other problems. 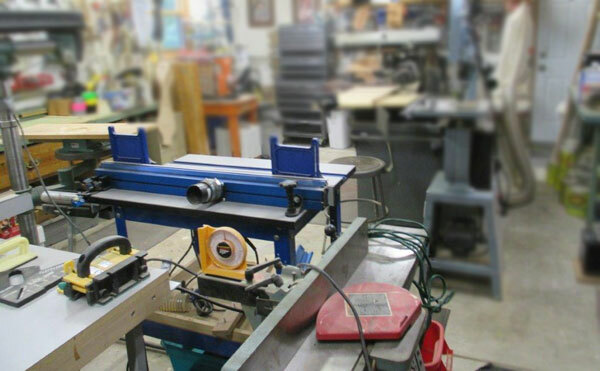 (9) Check planer blades and jointer blades for signs of wear or damage and perform necessary maintenance. (10) Check condition of band saw blades and blade tension. If necessary, replace worn blade guides. (11) Make sure you have an adequate supply of lumber required for pending projects. And of course consumables, such as sandpaper, wood stains, finishes, and wood glues. (12) Do you have enough wood clamps? Make sure your wood clamp assortment is adequate and that all clamping is in good order. We hope these tips will help you get organized and perform at your best! Do you have any tips to share? Post them below! John spent the better part of the 28 years he was employed by Klockit, designing hundreds of clock and furniture kits and plans and has continued with product design since his retirement in 2008. John’s love of clocks, his passion for creating furniture for his own home as well as for family, and his great appreciation for the beautiful finished pieces Klockit customers make from our kits and plans inspire him to continue to create still more new clock and furniture designs. Is Time a Human Construct? When we ask “What time is it?” we’re not trying to pose a deep question. There is a universal assumption that a correct time exists, even though we might not know what it is at the moment. Most of us also believe that time is both unchangeable and uniform. An hour is an hour, whether you live in the United States or the United Kingdom. It’s not true, however. Time is, and always has been, a human construct shaped by social interactions and customs. The language of the Hopi tribe in northeastern Arizona has no past, present, or future; for them, time is not a series of distinct instances. Similarly, nomadic tribes in Afghanistan and Iran use the seasons to measure time, making it a cyclical event. Allen Bluedorn, a University of Missouri management scholar, wrote, “What any group of people think about time ends up being a result of them interacting with each other and socialization processes.” In other words, time is a manifestation of social mores, just like fashion and technology. 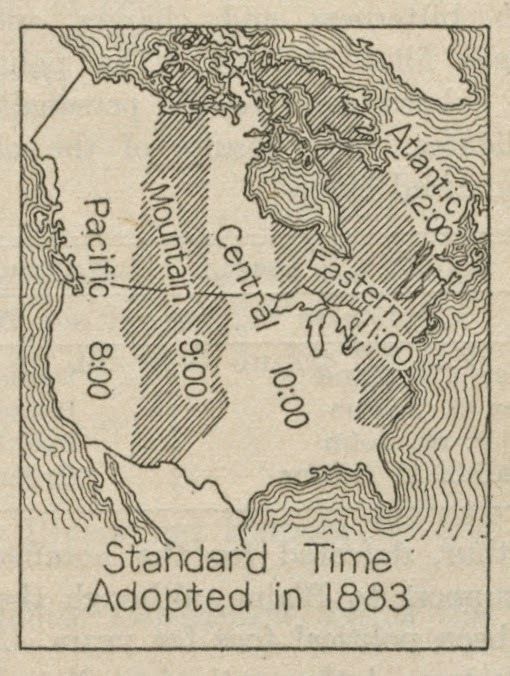 The U.S. national time standard didn’t come into effect until 1883, when the railroads adopted it to maintain shared timetables. Rather than a formal acceptance of an existing element, the adoption of national time struck Americans as revolutionary. The Washington Post likened it to the reformation of the calendar by Julius Caesar and later Pope Gregory XIII. The paper was reminding its readers—and the railroads—that seconds, minutes, and hours were not a natural phenomenon. Certain units of time, like days, months, and years were in sync with natural events, such as the earth’s movements. Anything else was too arbitrary and, in the case of the U.S. national time standard, too open to manipulation to be real. 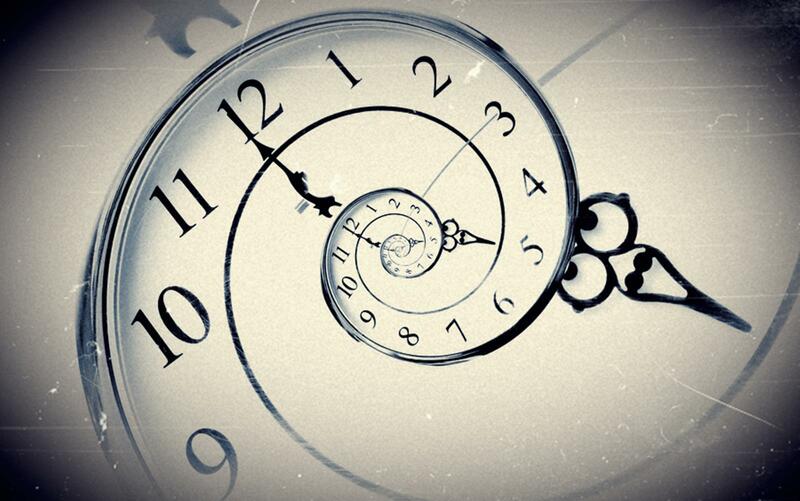 Even in societies that do live by the clock, not everyone shares the same concept of time. Americans are ultra-sensitive to timing, with their days consisting of one precisely scheduled event after another. Failure to be punctual is a sign of personal and professional weakness. For other cultures, notions of being early, late, or on time are not as rigid. In Brazil, people who are consistently late are regarded as being more successful than those who are always on time. The presence of these subjective views and the historic resistance to the standardization of time indicates that time itself is not an independent and natural concept. It has been defined and developed to meet the needs and expectation of any given society. There are suggestions that the current era of globalization is bringing nations more closely together and may one day result in a global time standard, but it’s not likely. At least not without a lot more controversy than the U.S. railroad barons encountered in 1883. THANK YOU to all who participated in our Spring 2015 clock contest! So many great stories – we truly appreciate the opportunity to hear about all of the great projects our customers have accomplished. Congratulations to the grand prize winners: Erin Keck (most creative), Roger Carson (gift of time), and David Schermock (best use of parts). See each of their photos below and read their stories behind the clocks. Also, please join us in congratulating the finalists! “I am an Art Teacher and Gallery Artist residing in Mechanicsburg, PA. I teach at Art Retreats and Schools throughout the U.S. using Klockit parts. 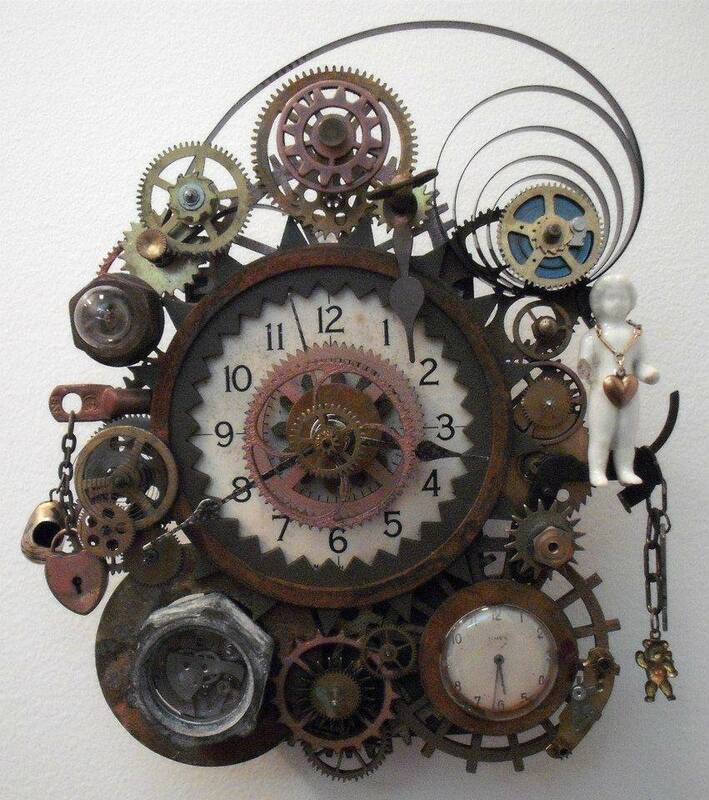 My Original Steampunk Style Clocks are recognized and known Internationally. I came up with the idea of creating these clocks after seeing an antique mechanical clock where all of the gears revolved. I wanted to create clocks that gave the illusion of movement by remaining stationary and running on a Quartz battery movement. “My wife Tiffany and I have lived at our current home for 7 years and previous to this lived one street over for 4 years. We became well acquainted with the area residents over this time. We didn’t meet Joella until we moved to our current home in 2007. Jo, as she prefers to go by, is a self sufficient, caring elderly widowed lady from Texas that wouldn’t take anything from folks willingly. The kind of elderly neighbor my wife and I grew up around that we don’t find too much of these days. Over the last three years Jo started to have some health issues. This was about the only thing I saw that slowed down Jo. Her son and daughter traveled from the west coast and decided it was time to move her into an assisted living home where she could live free but still have caretakers on site when needed. Her children discussed with us the decision as we were close to Jo and wanted us to be part of helping Jo transition. When it came time to help the family clear out Jo’s home her son asked my wife to help him in the basement. There, on a bench under some old pictures was a wall clock kit that was about 1/2 completed. He told my wife we could have it, that he would love to keep it and finish it but wood work wasn’t his thing. He said his dad, Al, loved wood working and his dad started the clock for Jo shortly before his death- in 1994. As soon as my wife told me the story we both knew that clock was getting finished somehow. I retrieved the clock and all the pieces of trim, etc… I could find and started the ‘puzzle’ of completing the assembly. Jo’s son said his dad couldn’t decide on a mechanical or “new-fangled” electronic movement. We wanted to make this stand out but Jo has hearing issues so I decided to go with the rotating crystal movement without sound. I was able to figure out where most of the trim pieces went (I hope) and purchased some hinges that I managed to fit to Al’s pre cut hinge mortices. I knew from all the fine hand crafted furniture Jo’s husband had made over the years that a darker stain was in order so I used a red Mahogany with 3 coats of gloss lacquer. We stopped at Jo’s assisted living home just before Christmas to offer her the clock that she had completely forgotten about. She was so surprised she had to sit down for a few minutes to take it all in. 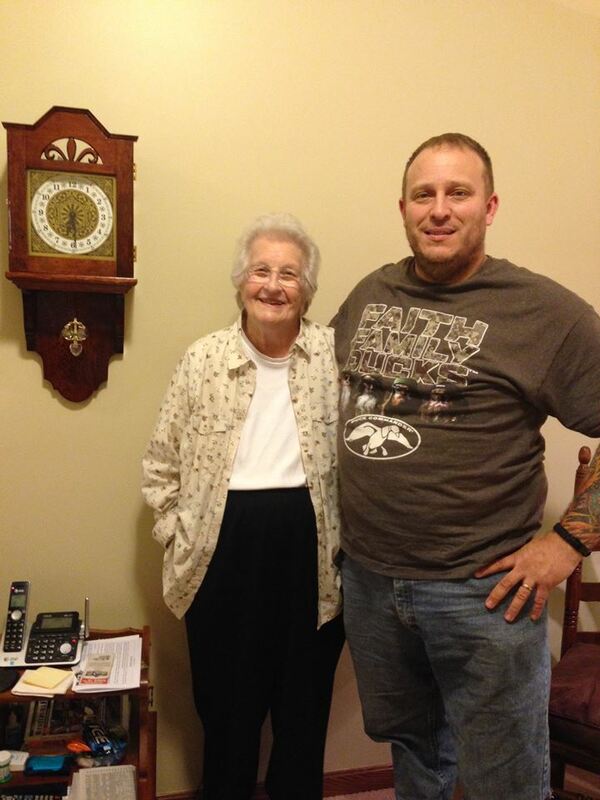 I hung the clock for her, listened to several more stories of her husbands love of wood working and got several hugs. The feeling my wife and I had from the smiles and joy we brought to Jo are like nothing we have ever experienced. Jo has called us several times and comments each time of the clock giving her a feeling of “home”, something she felt was missing in her assisted living apartment. “This clock is a “quartz movement version of the beautiful Jewelers Wall Clock” originally designed for a mechanical movement and found in all of the current Klockit catalogues. I have admired the Jewelers Wall Clock for quite some time but I typically don’t build clocks with mechanical movements so I passed over my mild obsession with this design and continued to build numerous other clocks. As always the arrival of the latest Klockit catalogue caused me to sit down and browse through it looking for items I could use and gathering ideas for my next clock projects. The upcoming wedding of my granddaughter had me searching for something elegant enough for a wedding gift that would be appreciated and hopefully treasured as a family heirloom. I kept coming back to the Jewelers Wall Clock as the ideal candidate. Sitting down with my latest Klockit catalogue I began going through it page by page identifying the various pieces I would need to build what I felt would be an outstanding example of a clock for the new generation newlyweds. As always, I found everything I would need to get started. In all, twelve part numbers and a lot of work would be necessary to build the clock. This clock makes an outstanding project and the sound from the Quartz movement (12003) is incredible. With the choice of melodies, volume control and night shut off this movement can be tuned to any environment and room size. With the speaker mounted in the top of the case and tone quality of this movement, the chime fills the room(s) with full rich sound. I prefer the Westminster. With over 175 impressive submissions, it was hard to choose 3 winners! Please help us congratulate these finalists!